The SAM-3 is a portable single channel signal conditioneer specifically tailored to provide power to and process the signals from MEDA's line of AC magnetic field sensors. The unit operates from eitherits internal batteries or the power line. It incorporates two sets of power line rejection fileters, switch selectable fro 50 to 60 Hz and the corresponding first four harmonics. The SAM-3 AC couples and buffers the signals from the sensor probe, provides a switch selectable choice of notch filters, a 500 Hz 5-pole high pass filter, or no filtration. A level control potentiometer allows continuous attenuation of the signal ahead of the final amplifier. 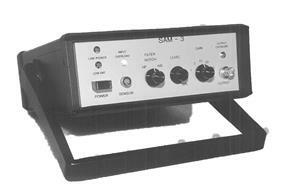 The final amplifier provides switch selected gains of 1, 3, 10, 30, 100. Overload lamps on the front panel alert the operator to saturation signal conditions on the input and the output. The SAM-3 will operate for 8 to 10 hours on internal batteries which are field replaceable with freshly charged batteries. It switches over automatically to line power when it is present. An indicator light signals the operator that the batteries are nearly discharged and that line power or fresh batteries are required. Both nickel-cadmium rechargeable and two types of single-use batteries are available. The unit does not provide for internal recharging of the NICad batteries; a separate charger is required (see specifications for battery and charger recommendations). A rear panel connector allows powering the unit from an external battery for extended periods of battery operation. An aluminum valise case is available as an option for carrying the SAM-3, a magnetic field sensor and a pair of spare batteries. Download the Data Sheet for a description of the SAM-3.